I like to do the occasional tag blog post just so that you can get to know me and mix things up a little. I have done a few of them previously so please click on the 'get to know me' label to read those. 1) You have to get rid of all your foundations, and only keep one highend and one drugstore which do you keep? I would keep Bourjois Healthy Mix Foundation which I absolutely adore. The coverage is and great and it wears nicely throughout the day. 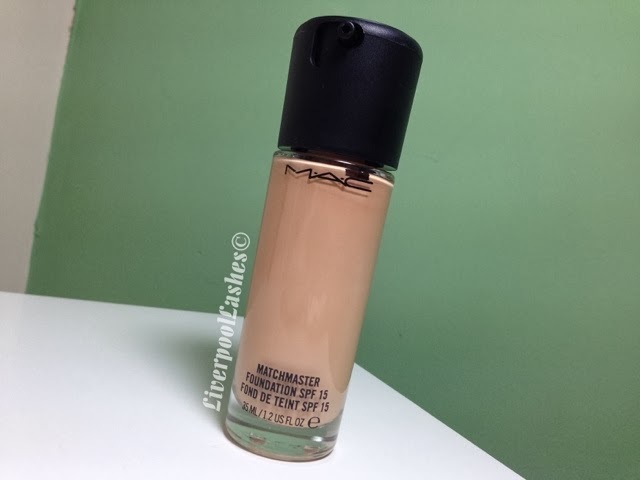 My high end foundation would MAC Matchmaster which really does work with your own skintone and provides a beautiful finish to the skin. I would definitely mention it but in a really friendly way so that I didn't embarass her. I just think that she would think of me negatively if she then looked in the mirror after my interview and then knew I hadn't told her the truth. 3) Your not feeling yourself and you need a pick me up lipstick which one do you go for? 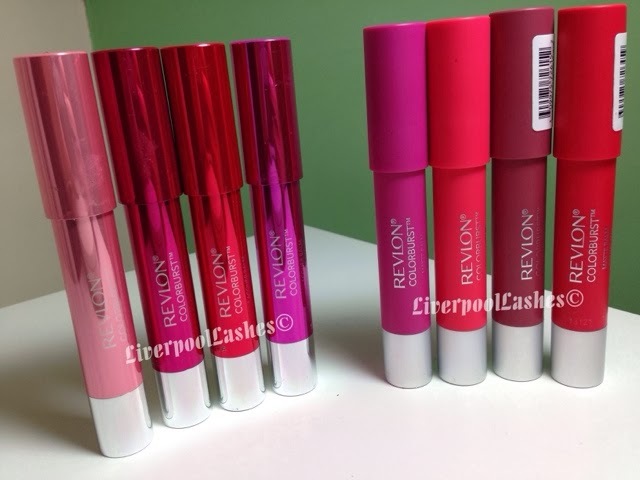 I don't have one specific lipstick but I would generally go for a super bright pink or red which would probably be a Revlon ColorBurst Matte Balm. 4) You go back in time for a day to your teenage years, how would you do to your hair and makeup differently? I probably wouldn't change my hair, it wasn't fantatic but equally there was nothing really wrong with it. As for my make up, I actually didn't wear very much at all to the point where as most people didn't think I was ever wearing any. 5) You ask your hairdresser for a shoulder length pixie lott hair cut but they hear wrong and give you a pixie hair cut. Do you a) smile, say thank you, leave and call your mum and cry hysterical b)cry in the chair and things get awkward or c) complain to the manager and demand a refund. I'd probably say C. I'm not someone to cause a scene but if the hairdresser is unprofessional enough to do that much of a drastic change without being absolutely certain that we are both talking about the same thing, then they need to be told. 6) Your friend surprises you with a 4 day city break and you have 1 hour to pack. Which 'do it all' palette do you pack in your makeup bag? 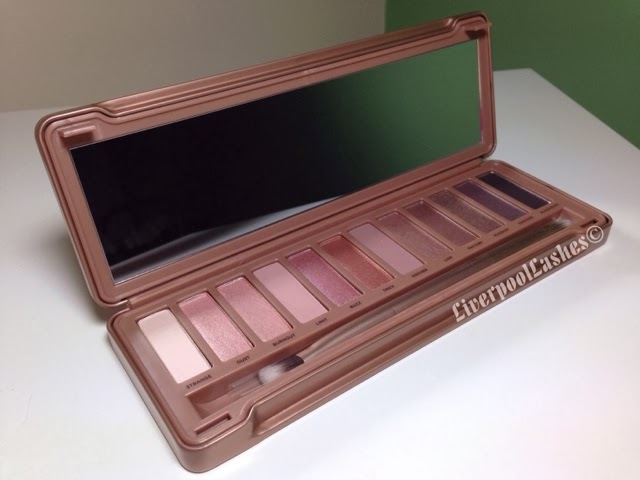 It would have to be a Naked palette but one? I'm going to say Naked 1 would be the one I would chose. I love all three but ultimately it's my favourite. 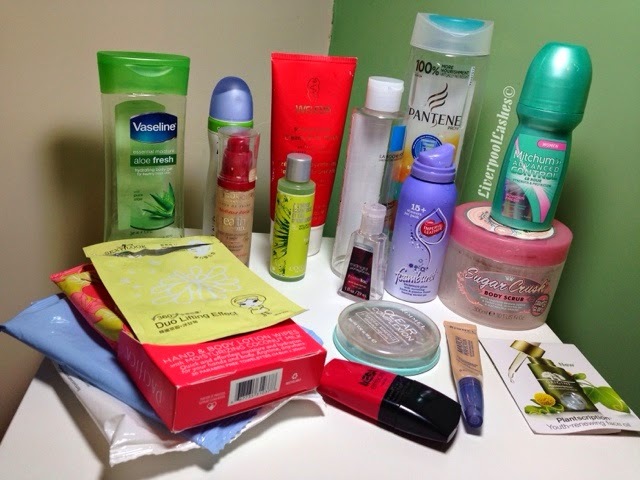 7) Your house has been robbed, don't worry everyone is safe, but your beauty stash has been raided. What's the product you really hope is safe? Honestly I probably wouldn't care that much but for the sake of the tag I'm going to say my two Lise Watier Portfolio Professional Correction Wheels just because they're Canadian, you can't get them here at all and I use them every single day. I'm going to hope and pray that I have friends with some respect for my stuff but if it had of happened then I would ask for a new one and let them keep the old one. My need for curly hair has been a work in progress. Before my hairdressing course I would that I was terrible at curling it myself. I just couldn't get to the back and then the only bits I bothered about is the top section so it all looks very amateur. Since starting the course I have been very interested in finally getting my hair how I want it. Although I'm naturally a brunette, I've been colouring my hair a red shade (above left) for the best part of two years so it was time for a change. 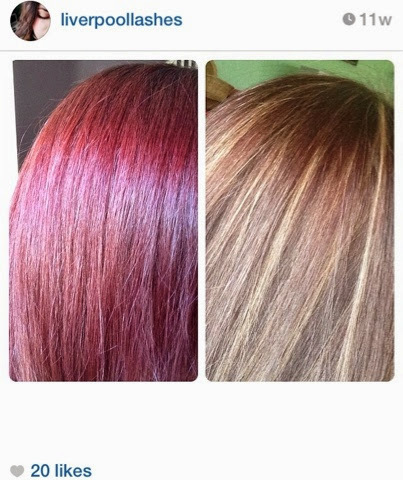 I chose to have it coloured back to my natural shade but have highlights added in a caramel tone (above right) to make the curly hair I craved, stand out. Recently I had a wet set in college from one of the other students for her assessment. This is literally, like the name suggests, to wash the hair, apply a setting lotion or mousse and then apply heat until they set the hair into that position. To be brutally honest I had no hope of this wet set being any good, Jenny would say this herself. 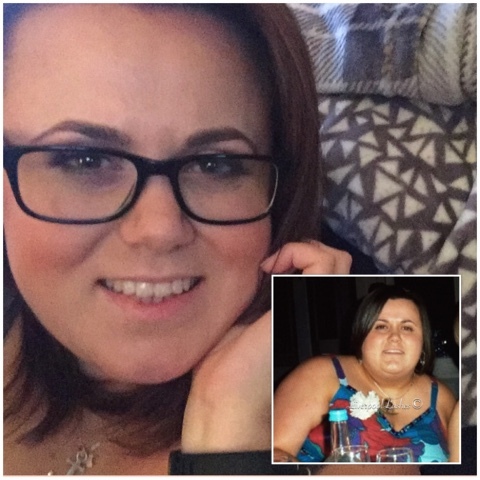 I have to admit I was blown away by the end result and Jenny was too! I do have Velcro rollers, curling wands and heated rollers but the best type of curl is really one that the hair is dried into that position. My wet set was a few weeks back and since then I've been getting itchy feet about doing it again at home. I nipped to the beauty supply store a few days back and bought the exact rollers Jenny used on me. 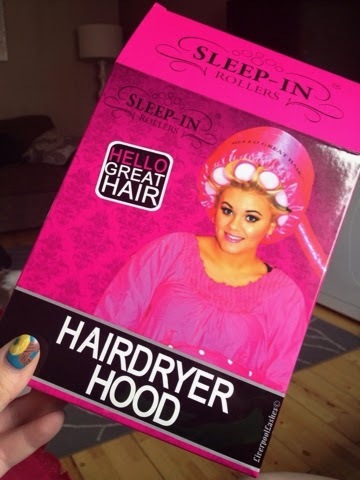 I then ordered myself the Sleep-In Hello Great Hairdryer Hood. Onto the review of the hairdryer hood! I have to admit I find pink things fairly tacky. I just think it's typical because it's a product made for the female market so they think that the only shade we appreciate is hot pink. Unfortunately Sleep In Rollers have gone with this thought also and ensured that everything from their product line along with it's packaging is in a fuchsia shade. The hood itself does look a little cheap, probably down to the colour but also the fabric being close to satin look which only reminds me of a nightie that you would buy in TJ Hughes. It has little vent holes along the tube into the hood itself and they aren't reinforced at all so I know that they will probably start fraying at some stage as this is evident already. Reviews online of this product state that a lot of people have a problem with attaching it to their hairdryer as the elasticated section isn't wide enough. I can definitely imagine this to be a struggle with a lot of hairdryers. Mine is a professional one and extremely narrow so it fits perfectly but the average Remington/Babyliss/TRESemme versions from Argos probably wont fit. I have to say that this hood works brilliant. The instructions state to dry your hair to around 80% dry, apply your rollers and then once your hairdryer is attached to the hood you can just put it on and ensure the drawstring is tight to stop any of the heat escaping. You are also to set your hairdryer to a medium heat and speed. I was a little concerned that the hood might be a little tight to put on as my head isn't the smallest sidenote: people with larger heads are actually more intelligent apparently but it fit easily on my head, covering in rollers and the drawstring pulls tight around my hairline. I would say overall this hairdryer hood works amazingly well. Obviously a full sized hood drier is always going to be the best option but it's a good alternative. I know that plenty of other companies make them but typical they're pretty old fashioned to cater for the older market so this just makes it young and modern. I actually don't think I would be without mine now! I make no secret of the fact that I am a complete and utter fragrance junkie. Anything with a nice scent just makes me happy, I will smell everything just to get a whiff of something pleasant. One of my husbands colleagues booked in with me to get her nails done. The moment she stepped through the door I smelt her perfume so on the way out I had to ask her what it was. 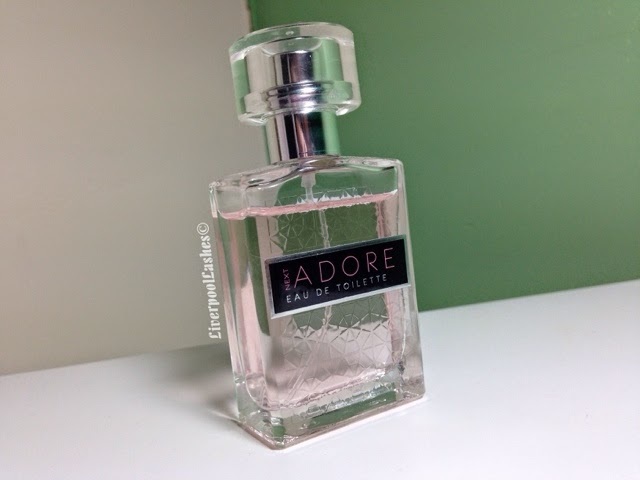 She laughed and said it's only Next Adore Eau De Toilette but she gets so many compliments on it. I was then telling my next appointment about it, she hadn't smelt it but then decided to surprise me with it for my birthday which was such a sweet gesture that she remembered. Next describe this scent as floral and golden amber. To me it's a very clean, sophisticated fragrance that's suitable for probably someone in their late twenties and right up to a senior citizen. I must say however that I don't think it would be to everyone's taste, I can't imagine a teenager or anyone in their early twenties liking it. That probably sounds a little odd but I do think it is typically to an older person taste. For the price I find that it lasts a decent amount of time and the fact that it's so inexpensive means you can afford to spray it everywhere when you need a fragrance boost. I don't believe in daytime and evening perfumes, I wear what I want when I want but I would definitely say this one could be suitable for any time of day. It's probably somewhere in the middle of a casual day scent and a deeper evening one. I feel like this is a great gift for someone who likes the super elegant and sophisticated scents. It's definitely one to check out if you're after a perfume on a budget! Let's be honest, reviewing a deodorant can be one of the more unusual reviews as no lady wants to admit to even the slightest glow. Well let's face facts, women perspire and for me apart from soap, deodorant is the basic step of every beauty (and hygiene!) routine. 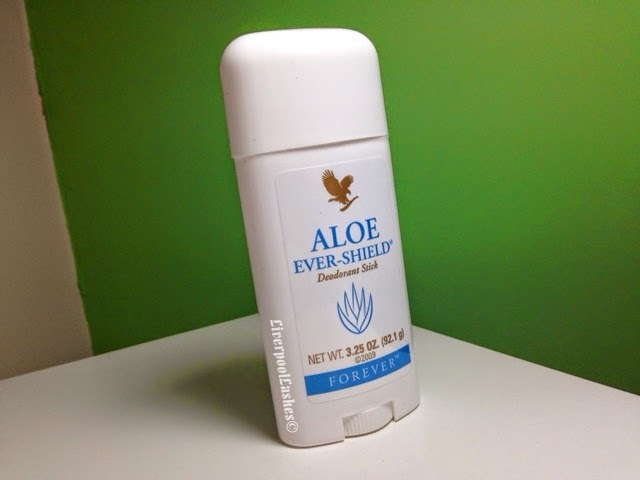 With that being said, today's review is of Forever Living Aloe Ever-Shield Deodorant Stick. Now previously to being giving this stick to try out, I have been completely and utterly faithful to my Mitchum roll on deodorant for quite a few years. It did the job of keeping me dry and fresh all year around after me searching for a long time for the right one so I have been loyal to it. Let's start off with the scent, I'm hesitant to say it reminds me of that typical talc fragrance mixed with clean linen. I really didn't want to say talc because that gives the impression it's some sort of floral and it isn't, it's just really fresh and clean scented. 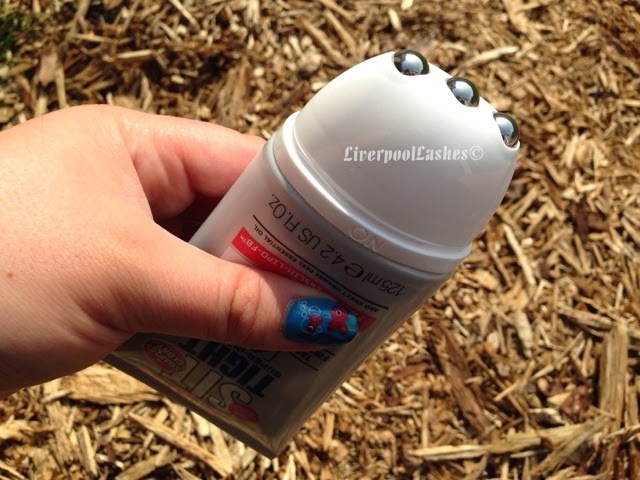 After using a roll-on for so long, applying a stick felt a little bit foreign to me but straight away I noticed that my underarms weren't overly wet so I could get dressed straight away. I also noted that they didn't feel as dried out afterwards either which is how they often feel with the Mitchum, to the point where as I will sometimes throw a bit of moisturiser under there after application as well to try and combat it. Always exfoliate and moisturise your underarms. 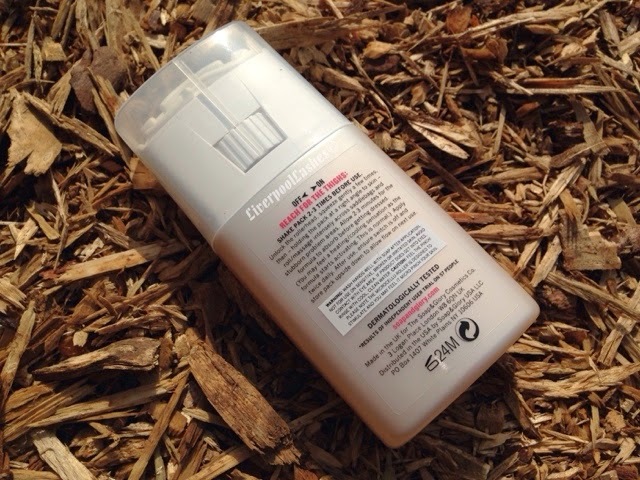 Exfolating gets rid of any build up of deodorant and dead skin which can leave that unattractive dark patch that you see and obviously the moisturiser will help it to look and feel smooth. I find the best thing to use is a Exfoliating Glove as they do the job really quickly and you can use it with your showel gel as you're washing under there. Aqua, Aluminum Zirconium Tetrachlorohydrex Gly, Glyceryl Stearate, Laureth-23, Magnesium Aluminum Silicate, Polysorbate 20, Behentrimonium Methosulfate, Laureth-4, Cetearyl Alcohol, Lauric Acid, EDTA, Tocopheryl Acetate, Aloe Barbadensis Leaf Extract, Parfum, Geraniol, Citronellol, Linalool, Benzyl Cinnamate, Coumarin, Limonene, Amyl Cinnamal, Alpha-Isomethyl Ionone. 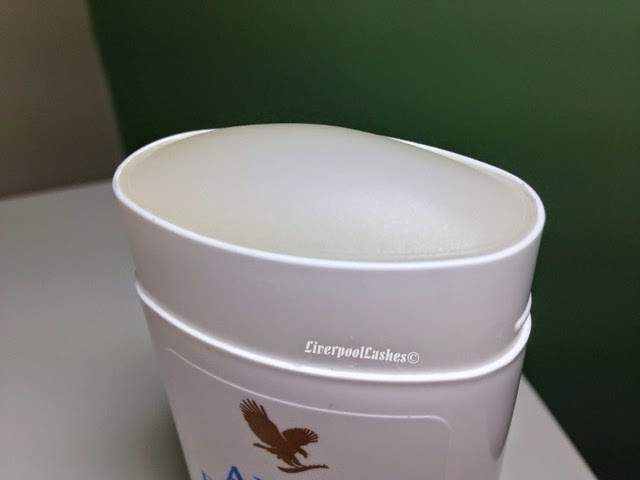 Since I've switched to the Forever Living Aloe Ever-Shield Deodorant Stick, I've noticed that my underarms are so soft and that's without me adding any extra moisturiser at all. I do find that the scent fades within a few hours which is fine by me, as although it's really pleasant it's good because often deodorant scents can almost fight your perfume to be top dog. The bottom line is I'm converted to this deodorant. It keeps my skin dry whilst does an amazing job at hydrating. Actually whilst I've typed this review, I've touched my underarms repeatedly as I'm sat with a vest top on. They're amazingly soft although I applied it more than 8 hours ago. This is definitely a high quality product and I recommend you check it out for yourself here. Thursday evening I was invited to Scouse Bird's event at Igloo Cocktail Bar to launch her association with the App "Klinked." I took one look at my current nails which I only did less than a week ago and decided it would definitely not go well with my outfit. In a split second decision shortly before I left, I removed my yellow, green and silver nails and was running through my mind what sort of design I could replace it with that was super quick but kind of quirky. 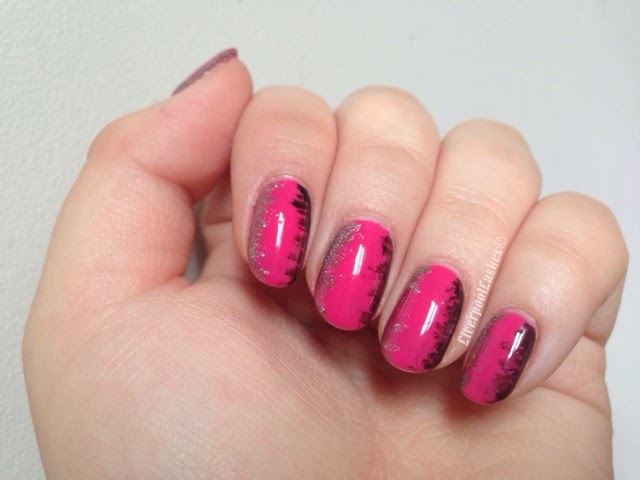 I came up with this abstract looking nail art using Shellac in Pink Bikini, Black Pool, Steel Gaze and Ice Vapour. I love that from a side angle all you can see is the black print and then if I move my hand, all that you can see is the shimmering metallic print. Today's review is a two for one deal. As the products are for a similar area and may be confused as the same product, I figured I'd put this together to make things a little clearer. If you've been reading my blog for a while you'll know that I met with the PR for Soap & Glory to hear all about their new product line. 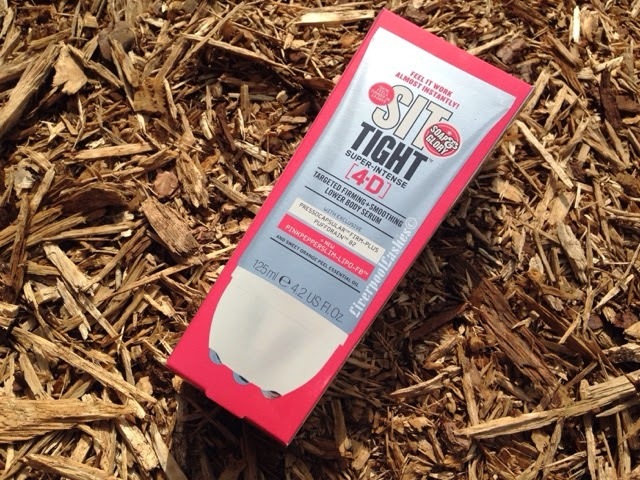 Part of that new range was Soap & Glory Sit Tight 4D Super Intense and Soap & Glory Sit Tight Saddlebags. 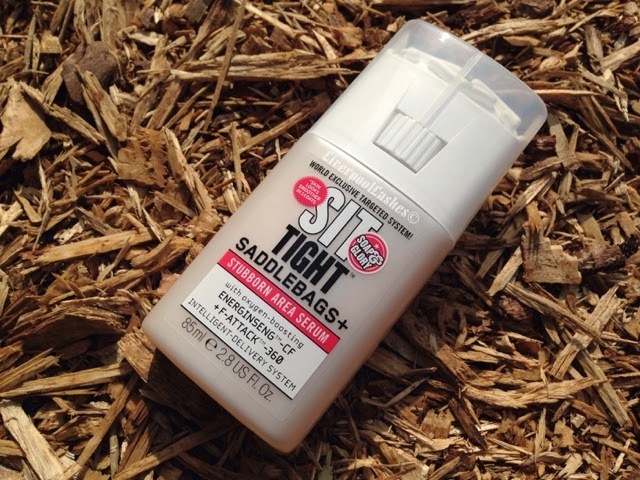 The difference between the two is that the Soap & Glory Sit Tight 4D Super Intense is intended to be used on the backs of your thighs and Soap & Glory Sit Tight Saddlebags has a different mas sager and formula for your saddlebags which is the widest point of your thigh/the side of your bottom. 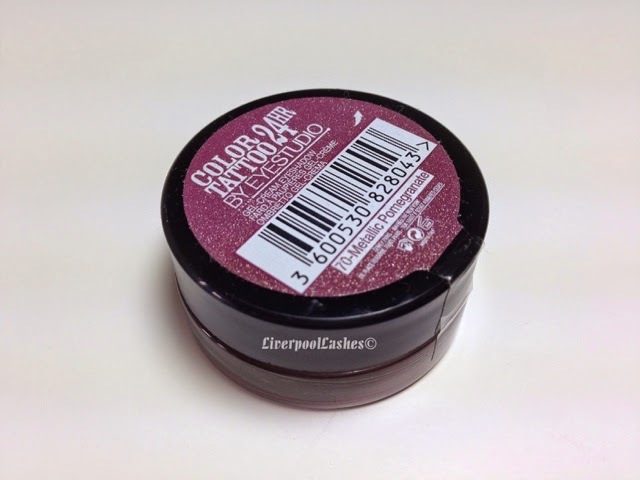 I'll start with my review of Soap & Glory Sit Tight 4D Super Intense. Now let me just start with the fact that I'm the wrong side of most average clothes stores but luckily, despite this my legs are pretty good. I had a couple of lumps and bumps but nothing that's anything too serious. Soap & Glory Sit Tight 4D Super Intense has a pink toned liquid that you squeeze out through three metal ball bearings which glide over the skin as you use it to massage and smooth out your lumps and bumps. When I first applied it I was super sceptical about it. I didn't feel any immediate change in terms of sensation until I sat down and boy did it hit me. It's not uncomfortable by any means, but I experienced a feeling of being unsure if my thighs were hot or cold. The best way for me to describe it is the combination of the feeling of Deep Heat and then the coolness of menthol, all at once! This feeling lasted initially for around an hour but seems to vary each time I use it. If I put trousers on a bit too soon it gets really hot in there! I'll go over the results and my overall thoughts of the both products are the end but lets move onto Soap & Glory Sit Tight Saddlebags. The massage device on this bottle really impressed me from the start. Once again there is a little 'on/off' spinning wheel that when it's in the 'on' position, will release the formula onto the tractor wheel style massager. 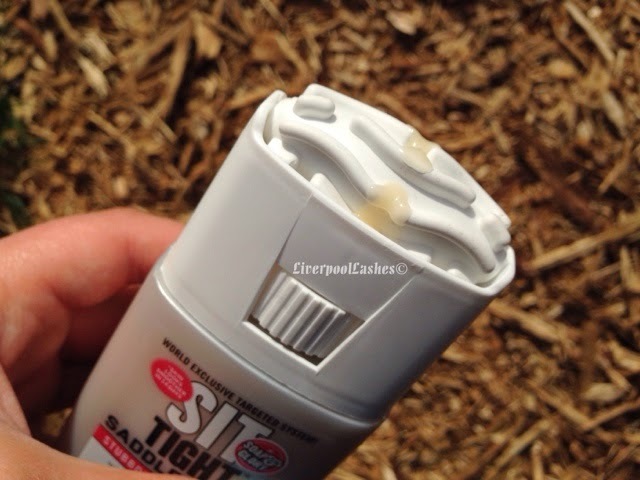 The scent of both Sit Tight products is somewhere between menthol and mint. I definitely think that the tyre track style motion helps on your saddlebag area as it's tougher skin so requires a deeper massage. I honestly don't think that using the Sit Tight Super Intense 4D here could massage like this as the ball bearings are much more gentle. 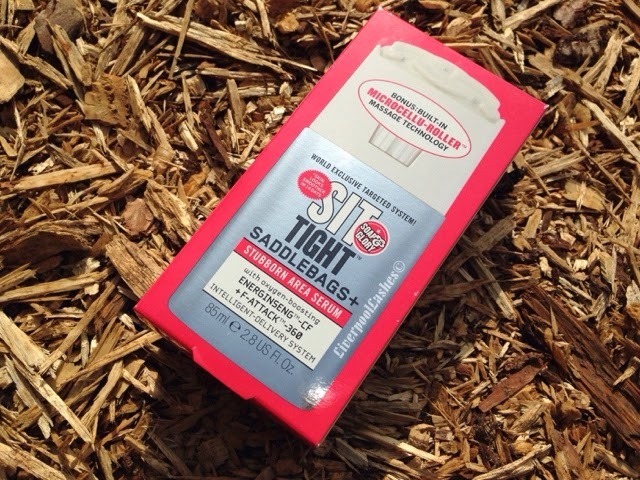 I have to say that with the Sit Tight Saddlebags, I didn't feel the same warm and cool sensations in this area. I'm putting this down to a lot of potentional factors such as that this area has a denser skin consistency. It could simply that whenever you're sat down or lying down this area does not typically touch the chair/bed which I think intesfies the feeling. 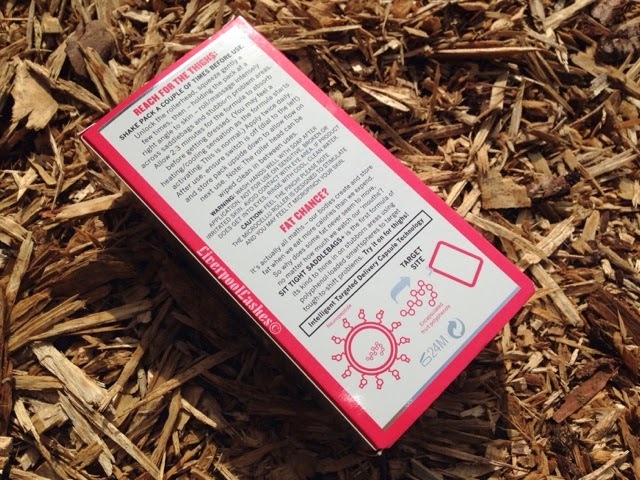 When I was first given these products to trial I did think that the Sit Tight 4D would be the one I would favour out of the two, it's the one that I felt more from while it's doing it's magic but I've explained my thoughts on that. That aside I honestly don't think they could do the job of the other one. The massagers are designed specifically for the area that they're intended for. 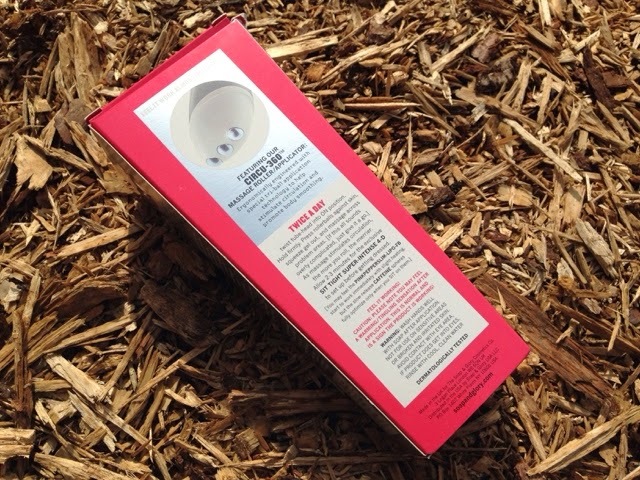 I noticed a difference in my skin texture and tone within the first week and then three weeks later of daily applications was when I would say they seemed to minimised with an added feeling of tighter, firmer skin. My skin felt super soft and hydrated and as for those lumps and bumps, they definitely feel smoother to the point where as I would actually say some are unnoticeable and there's only one I remotely notice now! Overall I would highly recommend both products to help your legs feel and look their best. I hope I've described them well enough for you to make your own decisions on which one you should purchase, or both! 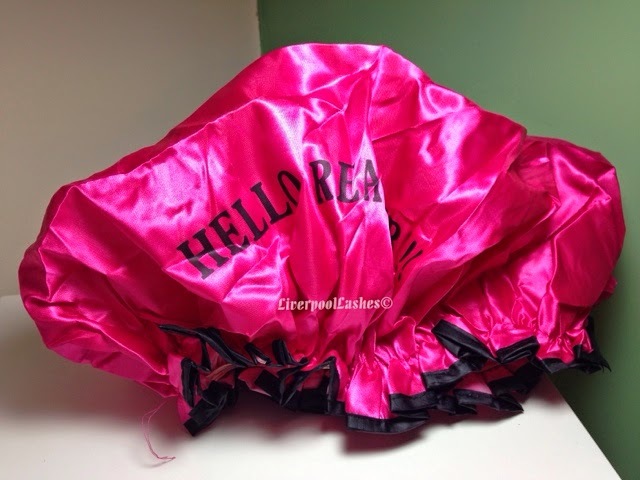 Today's post is on a shower cap, yes I never thought I would be talking about one of those. My recent obsession is curls and volume in my hair. I have the Sleep In Rollers (which is a whole review in itself, one is coming!) and I have the professional rollers for a wet set so I decided to invest in Sleep In Rollers Shower Cap too. Now this is a random, as a general observation I find that most shower caps only just cover my hairline. I prefer for them to have a bit more 'give' to them rather than having to stretch them over my head, random I know but hopefully you get me. 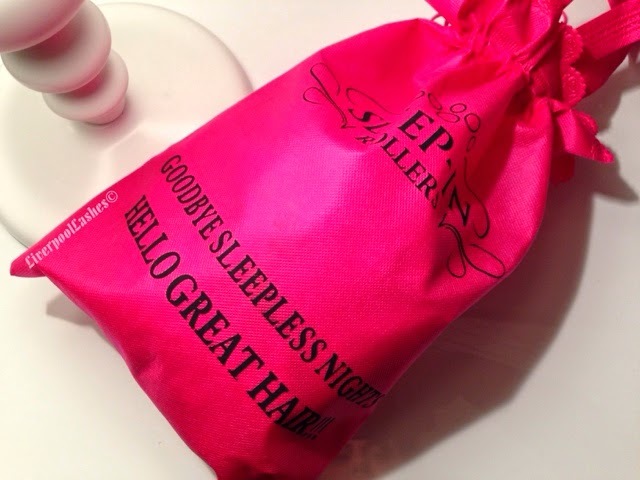 The shower cap actually comes in a pink bag which is pretty cute. It seems that everything by Sleep In Rollers comes in these bags and I really like them as my rollers and hood dryer (another one that I will be reviewing!) are all hung up nice and neat. This shower cap fits a full head of rollers in with no problems. I love that I can have my hair in rollers all day and then when I went to freshen up before I go to my special event or whatever I can jump in the shower, still in rollers but protect my hair - brilliant! 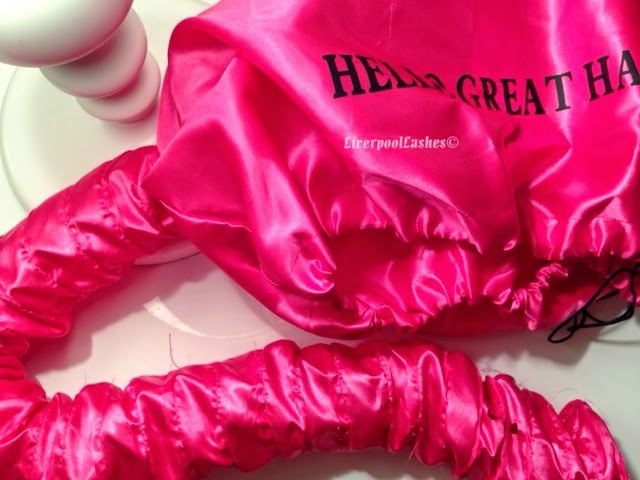 I actually can't imagine being without this shower cap now - does that sound sad?! 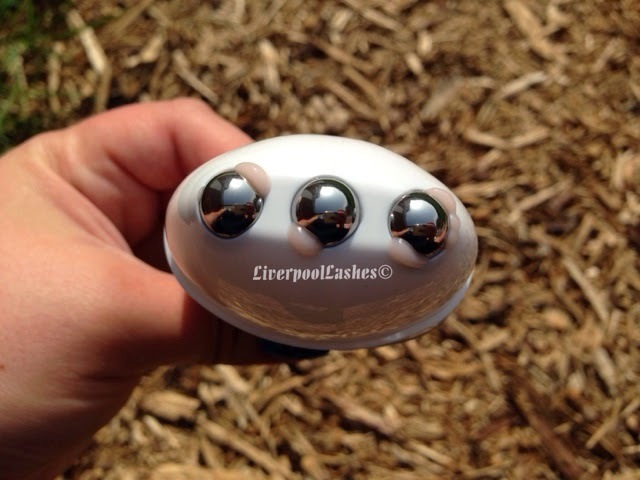 It's such a handy little gadget for any girl who's into her hair. Typically as well, if I'm doing something special that I want rollers in for, I will often have a spray tan so the two can be doing their magic at the same tan. Then I can shower off the guide colour and get ready! 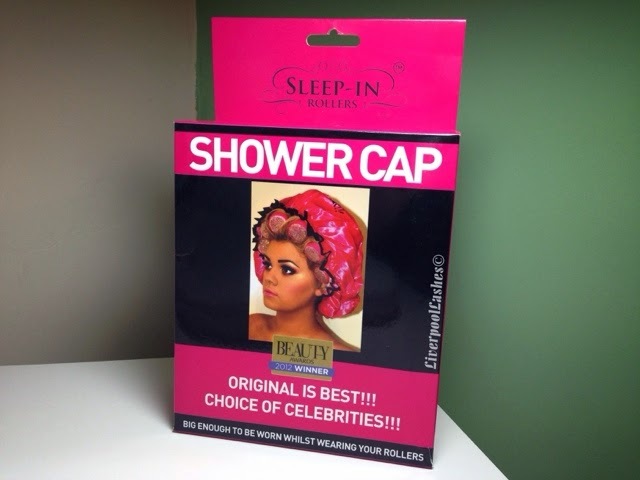 This shower cap is a must! I'm trying to get a little better/less lazy with my moisturisers for two reasons. Firstly I'm completely over stocked on body gels and moisturisers and secondly, looking at my legs after a spray tan I noticed that they are resembling snake skin which is absolutely horrid. 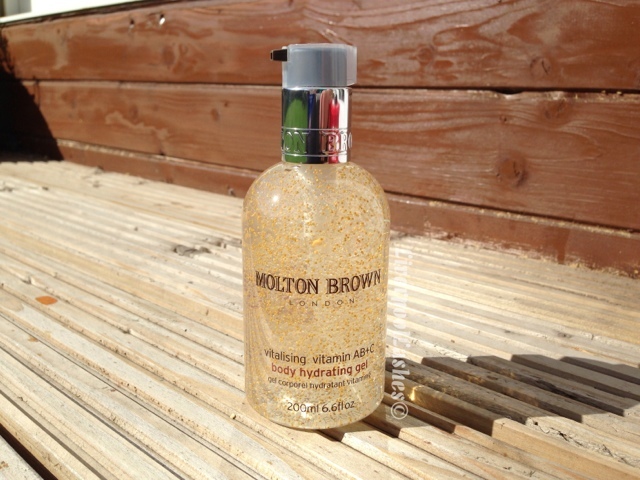 I bought the Molton Brown Vitalising Body Gel at their outlet store in Cheshire Oaks. I've said it before and I'll say it again, I adore gel body products. I would actually say I prefer gel to lotions, I just find they sink in better. The scent of this body gel is a really uplifting, refreshing one which is meant to be citrus. I will apply it after the shower in the morning, the formula is really light and it sinks in brilliantly leaving a slight healthy sheen. I love that it really hydrates dry skin and doesn't leave it sticky. The bottom line is that this is a really good quality product which I would totally expect from the brand name. You do get what you pay for but I do think that it's pretty expensive for what it is. If you're feeling the urge to splurge (no rhyme intended!) then I highly recommend it. I keep mine on my make up desk so that I can apply a little to my arms and to prompt me to use it a little more. 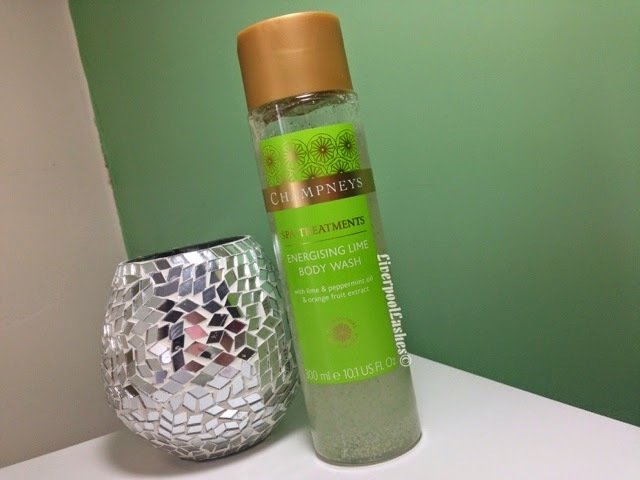 Today's post is on the Champneys Spa Energising Lime Body Wash which I bought as part of a three for two deal in Boots, along with other items from the range. As I said with the review the Foaming Body Scrub from the range, I expected a huge zingy lime fragrance and for it to be very 'get up and go' scent for the morning (like Original Source shower gel). However, it is very difficult to detect any lime in it and smells more of the peppermint oil in my honest opinion. 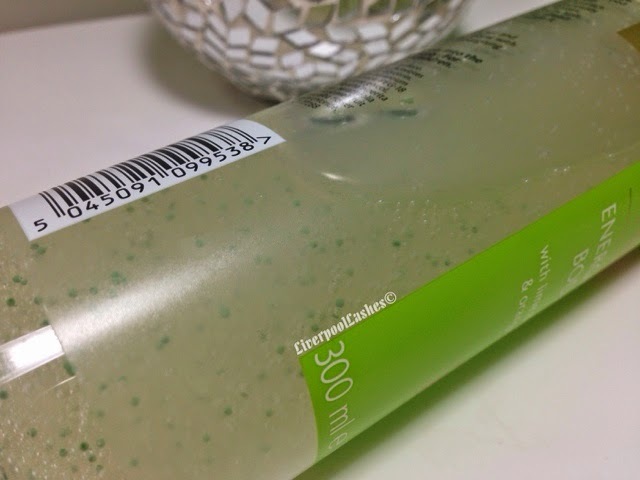 The texture is pretty gel-like with little beads that you can't feel and appear to either burst or disintegrate as you wash. I feel like this body wash it pretty difficult to review as it's not a horrible product, it smells pleasant but it's just not the citrus, zingy scent that I thought it would be. If you like peppermint and lime then you'll probably love this, if you're expecting a strong lime scent then you'll find yourself pretty disappointed. It does do the job and it serves the purpose but I don't feel like it's special enough to repurchase it again. In truth, if you're looking for a true lime shower gel you can do no better than purchasing Original Source Pure Lime Shower Gel for a fraction of the cost. Ever since I qualified I have heard of Dashing Diva but at the time I had made it my focus to invest the little money I had into Shellac, I just don't see the point in getting dribs and drabs of different systems. 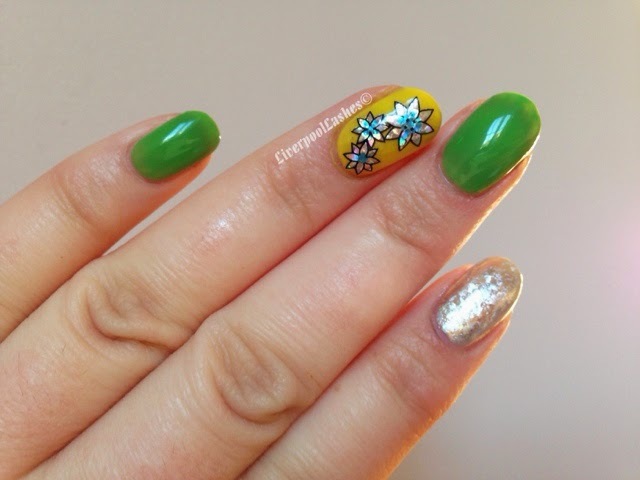 Here I am wearing Shellac Lush Tropics, Bicycle Yellow with Tropic Sunrise Additive over it, Silver Chrome with a silver holographic foil over it and then my new Dashing Diva Accents in True Enchantment on the ring finger. 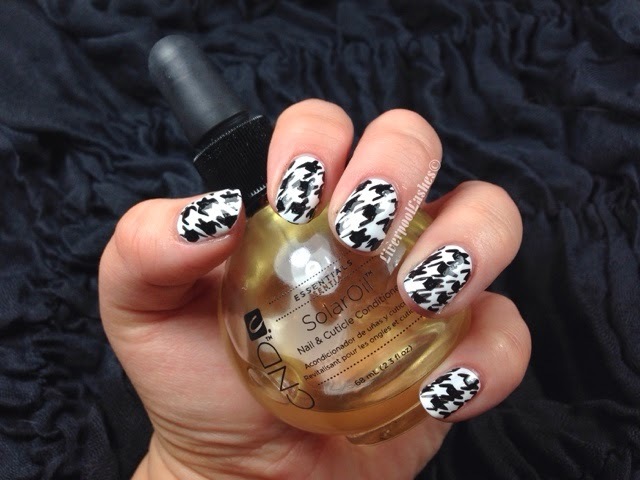 The Accents are so easy to apply and are extremely effective. I applied it with pointed tweezers that I use for semi permanent lashes and it was fairly straight forward. I will be trying the full nail effects shortly so I shall reserve judgement on them now but I'm hoping that they are as easy to use. Once I had applied the Gelife base coat and top coat it is completely smooth and seals the edges so that you can't feel them. 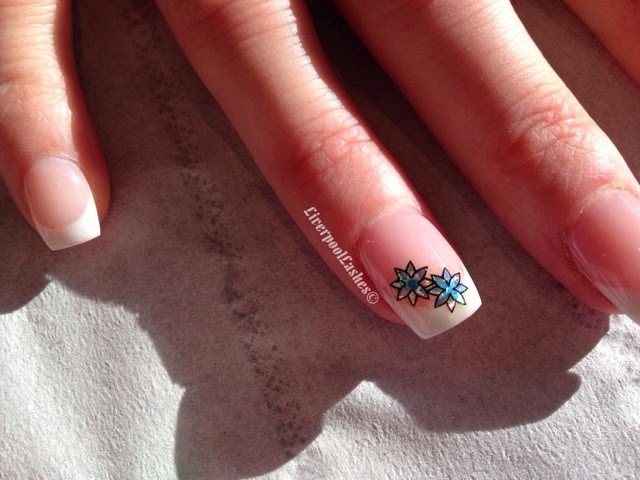 I also thought I'd include this photo to show you of my friend's nails. The Accents matched an outfit for a wedding she was going to so she was my first 'taker' of them. I think it looks beautiful over her extensions and she has since told me that quite a few people at the wedding commented on them. My only issue that that I wish Dashing Diva had a wider selection. There are many stunning designs but there are only a handful for the Accents range so I hope in the future that they do release more. Anyway, I hope you enjoyed today's little post. Once I've played around with them more I shall definitely make my video on them. I'd pretty much given up on my eyeliner dreams and stopped buying them, I just figured it was something that I was not meant to be able to do. 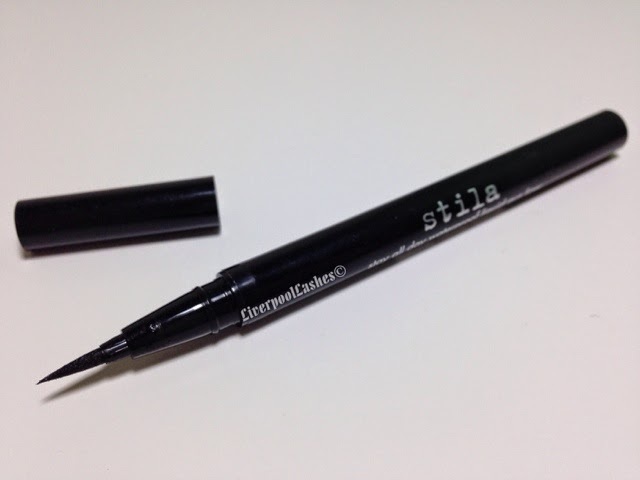 It was only when I bought a set of Sephora Favorites in the States last October that I decided to try again with one of the products inside which was Stila Stay All Day Waterproof Liquid Eyeliner. 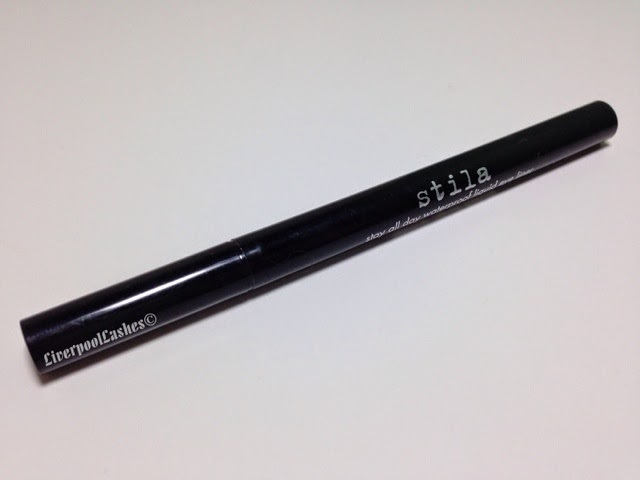 I've heard a lot about this eyeliner and that it's meant to be amazing at getting a really precise line so I was really keen to try it out. I distinctly remember Miss Glamorazzi on from You Tube talking about it. 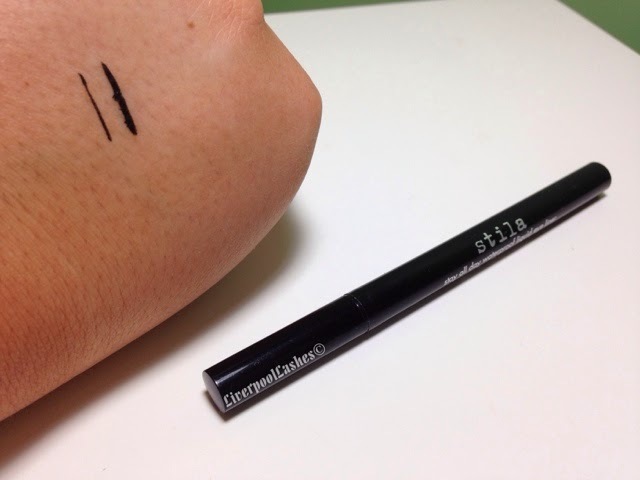 My eyeliner is in 'carbon black' which is incredibly black and pigmented. For some reason though, I did notice in certain areas it appeared a little glossy/like I hadn't applied it to the area properly, no matter how many times I went over it. In the end I had to dab on a little black eyeshadow to make it more of a matte finish. The pen is so fine that it draws a perfect precise line without dragging my skin at all. As I'm heading towards thirty my eyelids are not exactly perfectly smooth so this is definitely an important point for me. The lasting power is phenomenal. I'd say it probably took around thirty seconds to dry and once it was done it didn't smudge or budge at all until I was removing it. The cap has a sort of spring-loaded mechanism which pushes back at you until it's completely closed so that you will always know that it's definitely on properly. Overall I think this eyeliner is amazing. 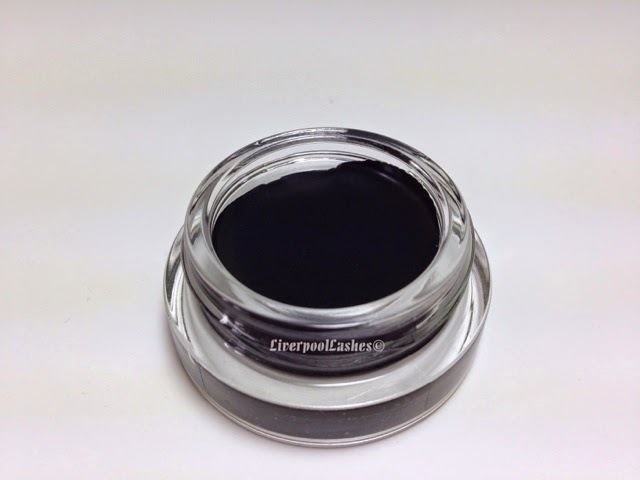 It's great if you have had previous problems with eyeliners not gliding smoothly across your lid. I love that I can trust it to last all day without transferring elsewhere or fading and I actually think the price is pretty reasonable as well. This is definitely one to check out! 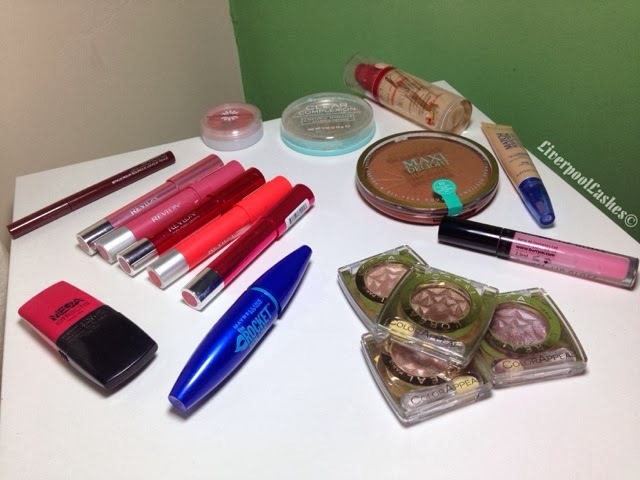 Recently I've really been trying to focus on using up some of my beauty products. A few weeks ago I sorted out my make up room and I knew things were getting out of hand. I would go to Asda for a new shower gel without a care for large amount of body washes and other cleansing products by various different brands that I was ignoring, it was completely ridiculous. a) It's going to take me a while to use it. b) I may actually not like it after all and then I'm stuck with a load of them. c) By the time I've sifted through a few of my hundred back ups I might actually want to try something different for a while and then I'm stuck with them. d) Storing stuff like a shop is just ridiculous. Anyway, I'll leave you with those thoughts and allow you to watch my therapeutic video of chucking out a load of old rubbish but reviewing them as I go. I literally love seeing the empty box at the end once I've thrown it all away, true satisfaction and making room for new products! 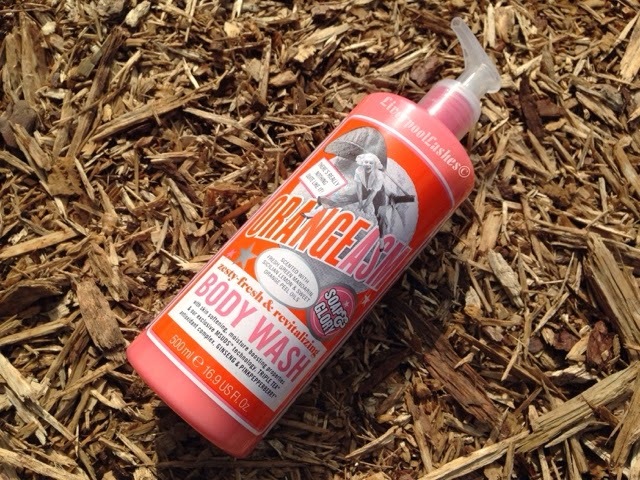 Today's post is a review of the newly released Soap & Glory Orangeasm Body Wash that I given to trial before the launch date. As I said with the Super Rich Body Butter from this range that I reviewed last week, the scent is definitely a citrus one which I will put down to the green Mandarin, Silician lemon and sweet orange peel oils. It isn't overly sweet which I attribute this to the green tea. I do love how refreshing it is when you use it in the shower, it really does work you up. Soap & Glory do claim that this wash contains moisture boosting properties which I always think is just something that they put on as a marketing idea, but I actually do think that it helps to moisturise my skin as I wash.
My only downfall with this body wash is that I really don't like the pump style packaging. It's exactly the same packaging as their Clean On Me Clarfying Shower Gel and it's something that's always put me off. I just prefer a squeezy tube when I'm in the shower and not to stand there pushing a pump. Packaging issue aside I do think at 500ml you do get a lot for your money. Typically they're often on a three for two deal in Boots as well which brings down the cost even further. This is definitely one for you to check out! I feel a little embarrassed writing this post as I have to admit that I'm a total wally. I posted my video on the April edition of Love Me Beauty box and a number of subscribers wrote underneath that it was the March box and I was indeed, receiving my boxes as a delay from the previous month. The reason for this was that I wasn't logging on and choosing the option before the deadline. I do feel a bit stupid because I'm normally on the ball with everything. I'm not quite used to having to action anything through the month as I'm so used to 'getting what I'm given' from GlossyBox and BirchBox. I did as I was told when I read the comments on the video and logged on to pick my box for April. I have to admit I wasn't wowed by the options and from what others have said to me on Instagram, they weren't either. It was basically a Redken product, a rollerball, a Model's Own product (two were polishes and one was a nail art pen, unfortunately I had both of the nail polishes) and another hair product. If you're a regular reader of this blog then you'll know that my current hair obsession has been taken to a whole new level since I started my hairdressing course. These thoughts have been made worse when yesterday I was cutting a little girl's hair. Her mum said to me 'you know, I judge hairdressers on how their own hair is. If it's not good, I wont go to them.' She wasn't being funny at all but this has confirmed my thoughts, I need to get my hair looking amazing. Since my hair has recently been both cherry red and is now coloured as well as highlighted, I'm all for the hydrating products. 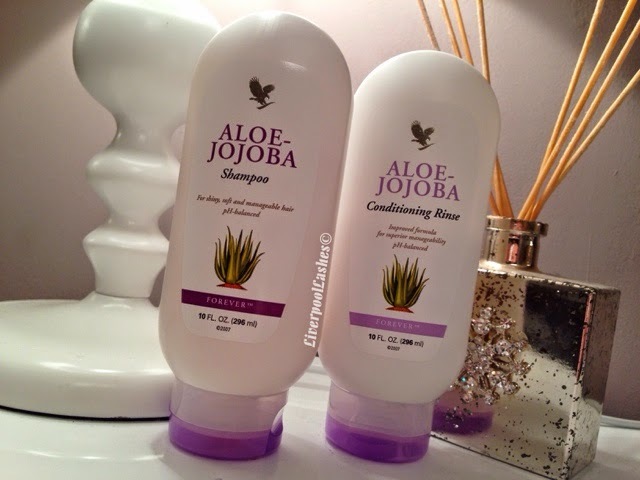 I was kindly offered to test the Forever Living Aloe-Jojoba Shampoo and Aloe-Jojoba Conditioning Rinse and of course, I was ridiculously excited about this. I'm a big fan of the instant result items, typically hair products that take a while to show any difference are just coating each strand in some sort of silicone to give the illustration of healthy hair, but aren't actually doing anything beyond this. 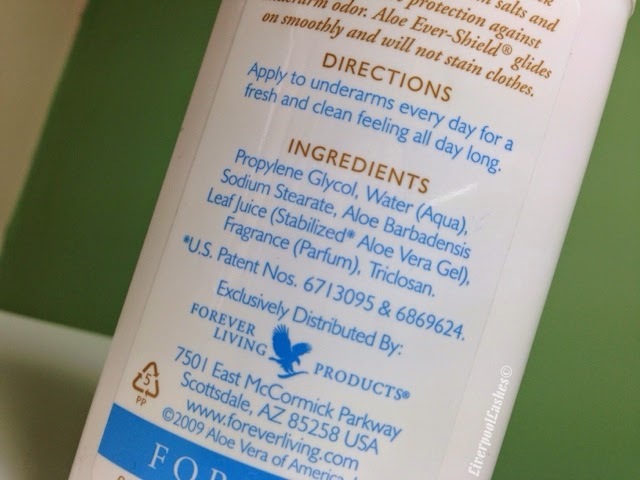 Let's start with the Forever Living Aloe-Jojoba Shampoo, the scent of it reminds me of a luxury hair salon. I don't think I can pinpoint a particular scent apart from saying that it's a really clean linen / soap fragrance and leaves your hair smelling amazing. The consistency is a pretty thick, gel-like texture which means a little goes a long way. Previously I have reviewed shampoos that I've had to throw huge handfuls of it on to actually cover my scalp and lather. That was a particularly expensive shampoo as well so I feel like this really matters. Forever Living do market this as a concentrated formula that you can use sparingly so this is spot on. I typically wash my hair, rinse and shampoo again to get is really clean as I don't wash it everyday. With this shampoo the first wash left my hair super clean and squeaky so it didn't need that second wash at all. Now onto the Aloe-Jojoba Conditioning Rinse, again I'll start with the fragrance. Oddly I think it has a different scent to the shampoo. It's absolutely gorgeous and the best way for me to describe it is clean linen with a twist of floral almost. I have to say, I had my reservations initially about the conditioner as when I applied it my hair it seemed to drink it up a little but didn't leave my hair really slippery like others do (straight after application, before rinsing it.) I reserved judgement on it at this point - however - as I remembered one of the Lush products I have recently tested and this was the same. Sidenote: I compare every hair product to the Lush range as their founder is a trichologist (a hair specialist.) I was literally reminding myself of this in the shower so then I happily rinsed it away. To be honest, my hair still didn't feel soft or anything when I climbed out (which is again like the Lush product.) I mention this because it makes you think what all of the other big brands put in their products to give you that really slippery feeling that you get with them. I do now wonder if it's all smoke and mirrors to trick you into thinking it's brilliant. Once I've blow dried my hair, that's when the results really shine with this product combination (no pun intended!) My hair is left soft, shiny and really hydrated each and every time. They're both also formulated to help balance the pH level of your scalp, however I do not have scalp issues so I can't comment on that side of things. The long and short of it is... if you love your hair, you'll love this shampoo and conditioner. I always, always, ALWAYS run out of shampoo before conditioner. My shower is filled with conditioners but I think because of the gel consistency of the shampoo, they may even last a similar amount of time. I would like to see this line in a salon or spa as I think it would be a perfect range to retail to clients, along with other fantastic products like personal care, skincare and much more. I can also imagine it in a holistic therapy centres too. If you're wanting to become a distributor for Forever Living you can actually join here. I actually don't know why I did this but when a GlossyBox arrived this month I was really surprised. Somewhere deep into my mind I actually thought I'd cancelled it. Life has been hectic recently so trying to keep track of everything can sometimes be a struggle. I summarise my thoughts on this month's box in the video I filmed. I don't want to come across as one of those people that just won't be happy with anything but it is my true thoughts and there are definitely some positives there too. 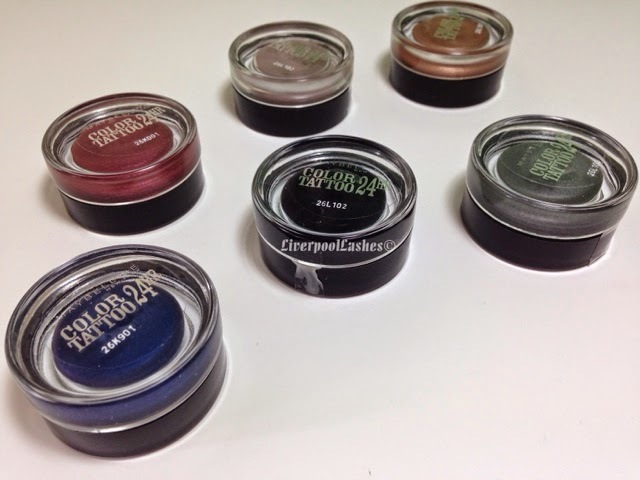 Let's be straight up here, when I watched my friend buy a load of Maybelline EyeStudio Color Tattoo 24 Cream Eyeshadow on my recommendation, I thought to myself "Pfft, I don't need them when I have my amazing MAC Paint Pots!" Well I'm here to tell you that I caved! I caved everyone and I'm proud to say I've quietly given myself a sharp slap around the chops for my make up snobbery. I should have known better as I have found loads of cheaper products that wipe the floor with the high end stuff! 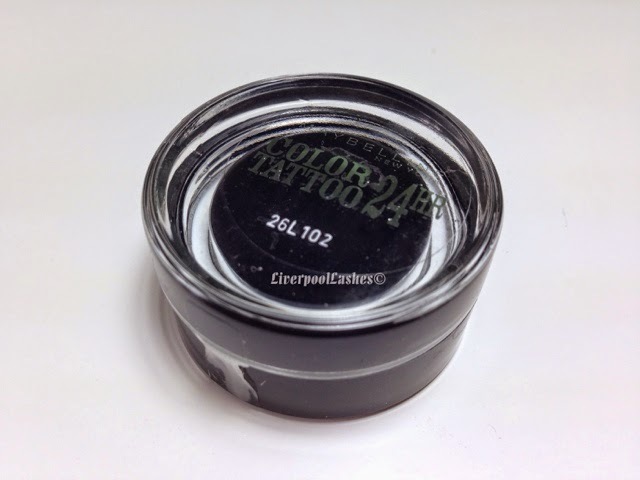 Now I have already reviewed the first shade I bought which was from the States called "Inked In Pink," back in November 2013 (click here to read the review.) I said at that point that I needed to explore it further and then the other week I just went through a funny patch. I decided I needed to get every single colour that I would possibly use, in one foul swoop! Yes I bought these six shades all in one go on a three for two offer in boots! 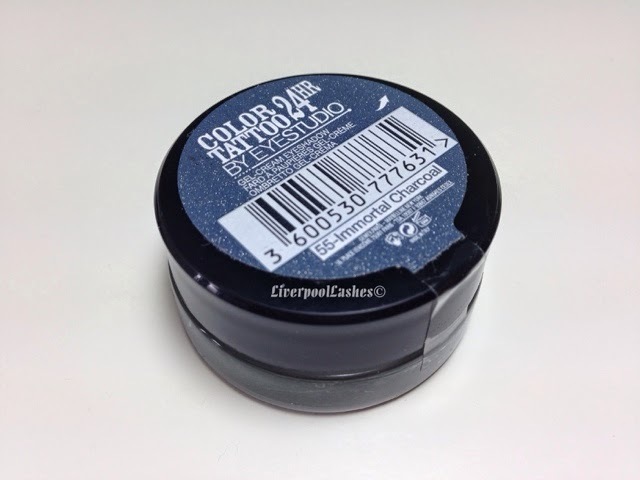 Let's get started on the first shade which is 25 Everlasting Navy. Straight off I think the name is a little off as I would say that this pot is more of a royal blue than a navy. Thankfully I bought from the store so I knew exactly what I was getting myself into. 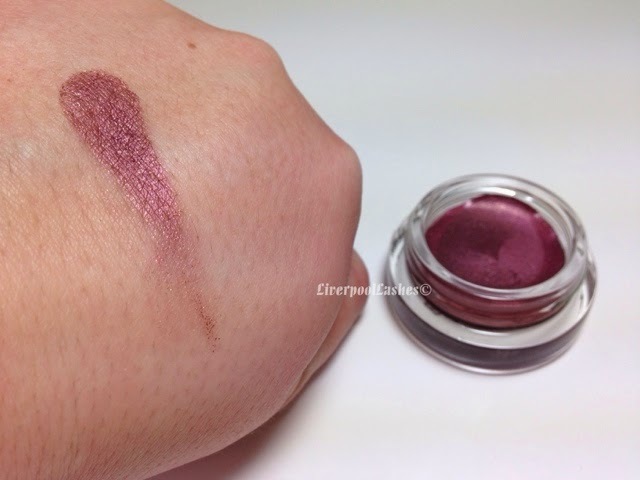 It is a beautiful colour, I bought it to use more as an eyeliner than all over the lid. 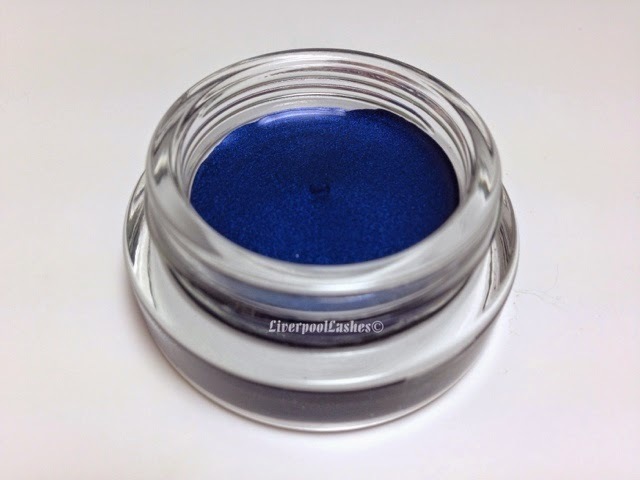 I recently posted a photo to my Instagram of me wearing this colour blue on my lower lash line. I just woke up one Sunday and decided that that was what I had to do with my eyes that day. 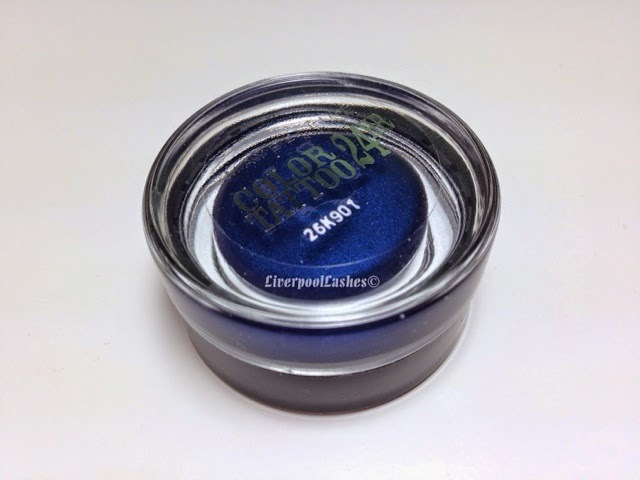 I may be tempted to wear this on my lid with a lot of really deep colour in the crease. At this point I'm not sure if I would suit it but that's the beauty of make up isn't it? It's all about playing about with what suits you! Generally with each one of these I probably will set them with a similar coloured eyeshadow unless I really am stuck for time or something. 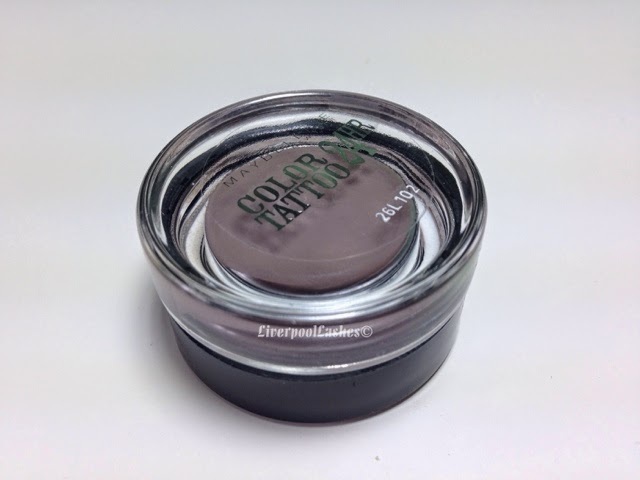 The next shade that I bought was 55 Immortal Charcoal. Laughably this is actually the shade that made me go to Boots and buy all of rest too! I really wanted to get myself a dark grey for my darker eye makeup days. 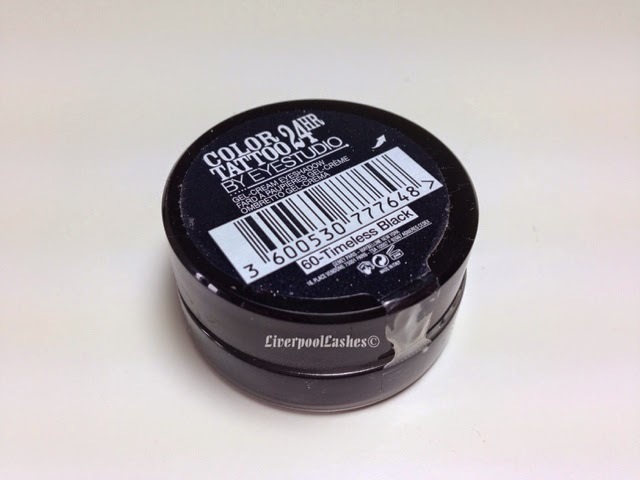 Typically I use MAC Paint Pot in Painterly which is a flesh colour. 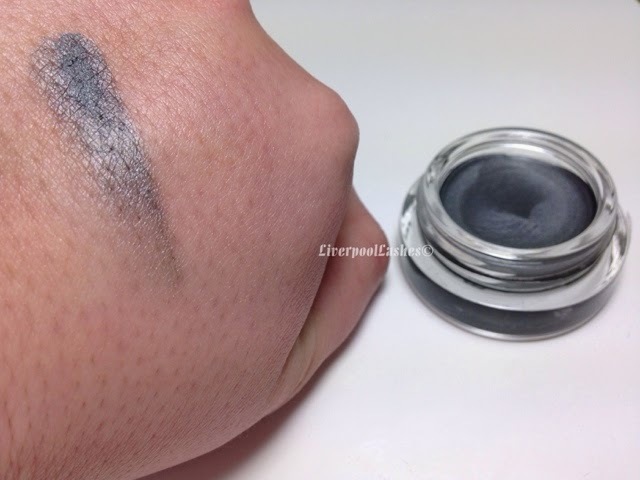 It's perfect for the more "everyday" eye looks as it will work with everything, but I really wanted some more pigmented cream eyeshadow bases to work with and intensify the darker eyeshadows that I love to wear. I would say that Immortal Charcoal is somewhere between a silver and a grey. 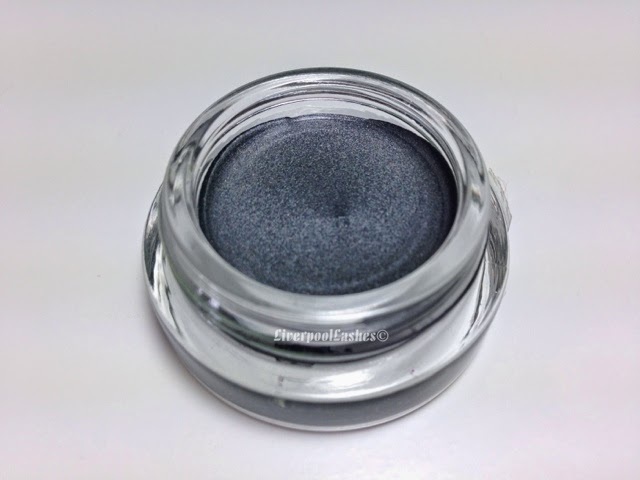 It works brilliant with a classic smokey eye and just like Everlasting Navy, I wear this on the lid with a deep colour in the crease and underneath my eyes also. Next up is 60 Timeless Black which is exactly what it says on the pot! 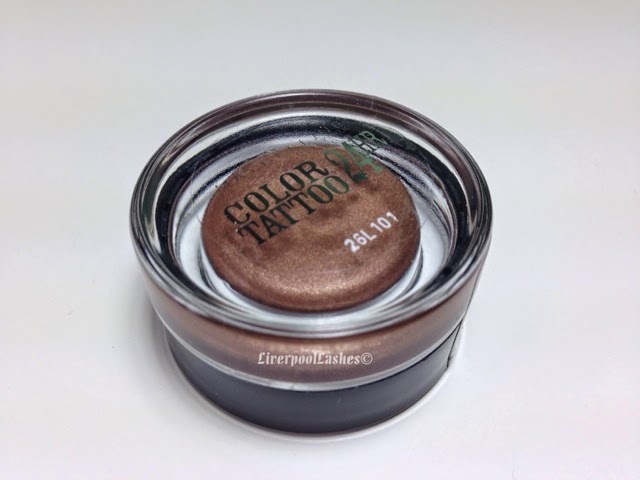 I dithered about getting this one and it was in fact the last one I picked up once I had decided on the other shades. 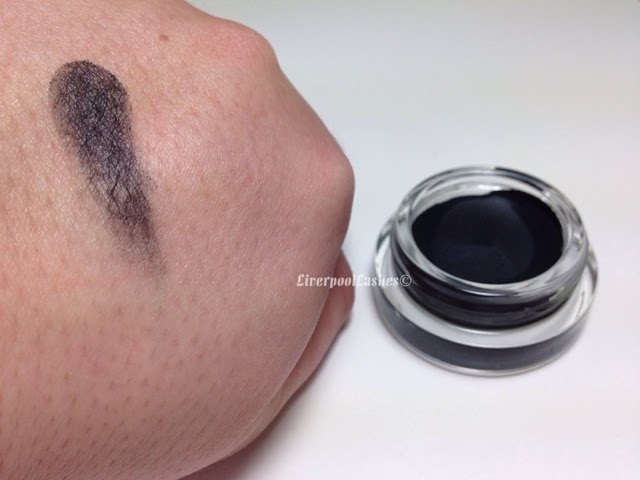 The shadow itself a cream black (it has no shimmer) I thought this was worth highlighting for anyone that wants the option to apply shimmer on top or just wants that deeply black look. 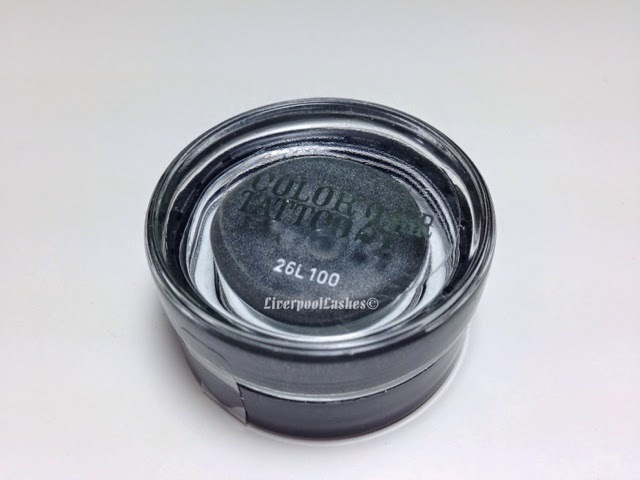 It's definitely extremely pigmented without the need to really even build it up. 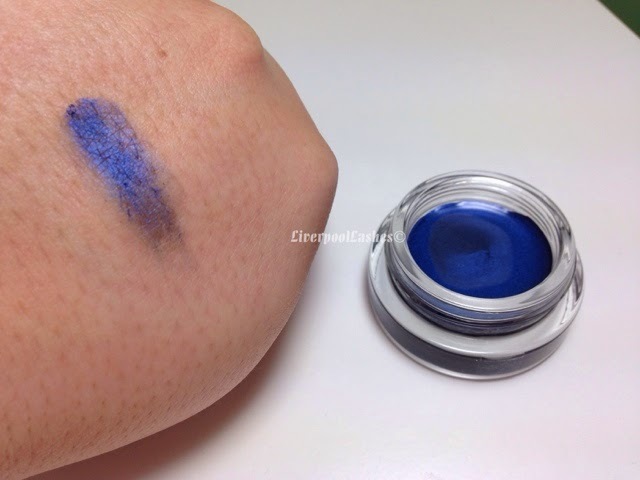 The above photo with the swatch on my hand was literally one swipe! The next colour is 35 On and On Bronze which I know is called Bad To The Bronze in the States (I love when they do that, very odd!) I feel like this is the most talked about shade amongst the You Tube and blogging communities. I'm not even going to lie, I don't need this one. 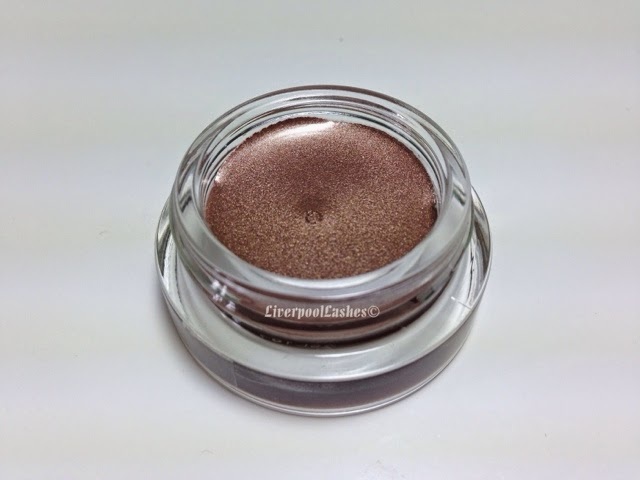 I already have MAC Paint Pot in Indianwood which is that same sort of bronze/gold tone. It probably isn't very similar but I am mainly using them as a base to intensify so it ultimately doesn't really matter on the specifics of the shade for me. With that warped logic, I still wanted it. If I ever need something quick without a powder eyeshadow over it then I know I will run/open my huge make up stash and pull out this one. 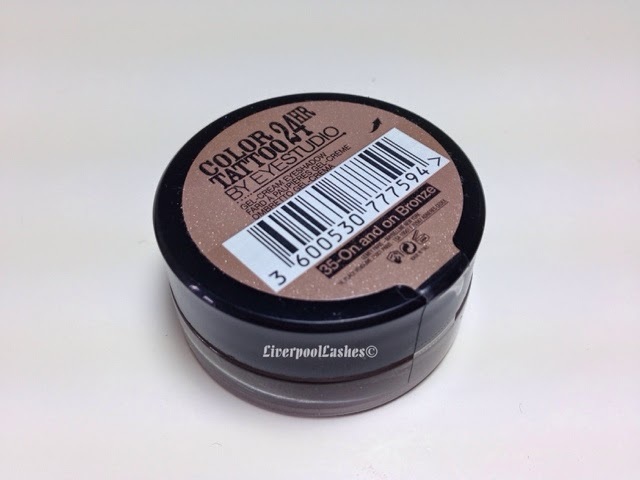 As this is only £4.99 and MAC Paint Pots are £15 a pop it's a no brainer when it comes to me repurchasing as well which is definitely something to think about. Next up is 40 Permanent Taupe. I had to have this one, okay I didn't but I wanted it. 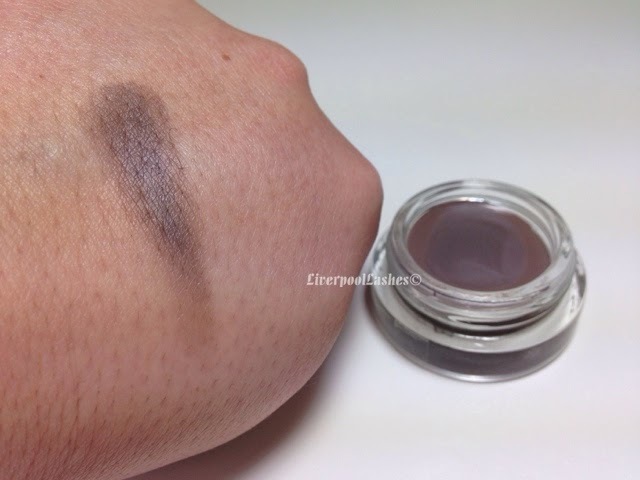 I often wear MAC Quarry eyeshadow all over the lid. I'll add something else with it to darken up the crease a fraction for more depth but it's definitely a firm favourite look that I like to wear. I love this shade in anything, nail polish, eyeshadow, everything. It's just so sophisticated and will work with everything, it's a real multi tasker. 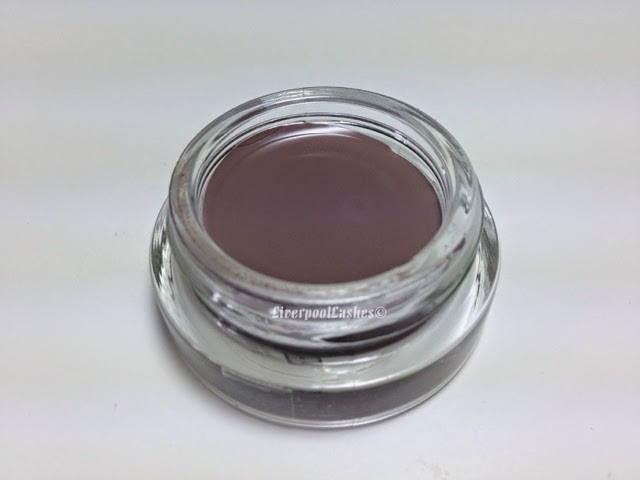 Permanent Taupe is a cream taupe shade, if you want to add a shimmer to it you can or like my MAC Quarry shade, you can make it completely matte. 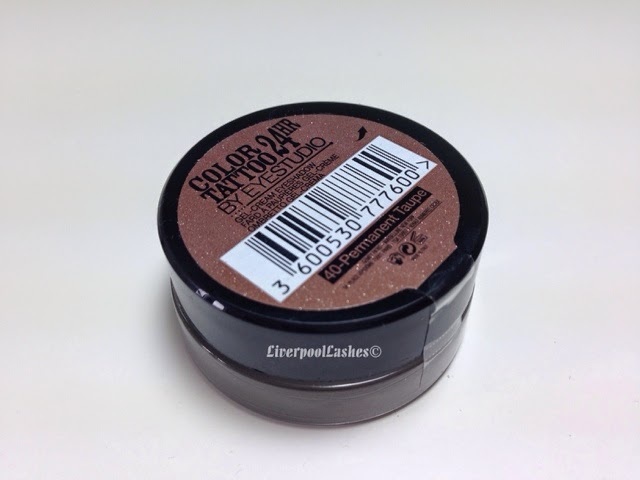 I have to say I think that this is an absolute must for anyone who wears eyeshadow. I'd be surprised if it wasn't a much loved shade in any make up lovers collection. 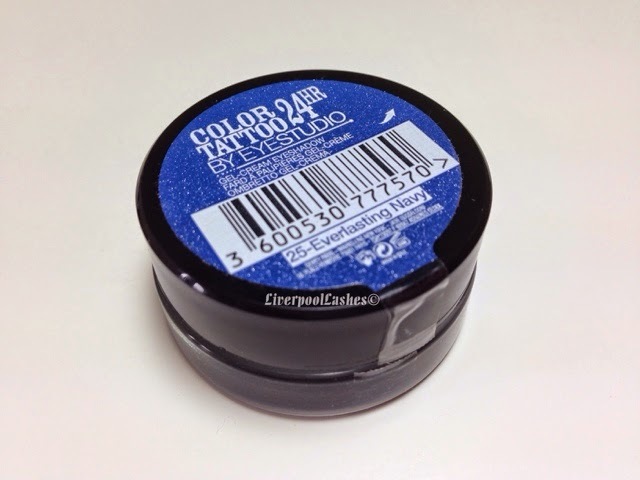 The last colour I bought on my crazy Maybelline Color Tattoo rampage was 70 Metallic Pomegranate. I have hazel eyes and one of my absolute favourite colours to wear on my eyes are purples as they really bring out the green in them. In particular, my ultimate favourite eyeshadow is Urban Decay Last Call which I reviewed last September (click here for the review.) 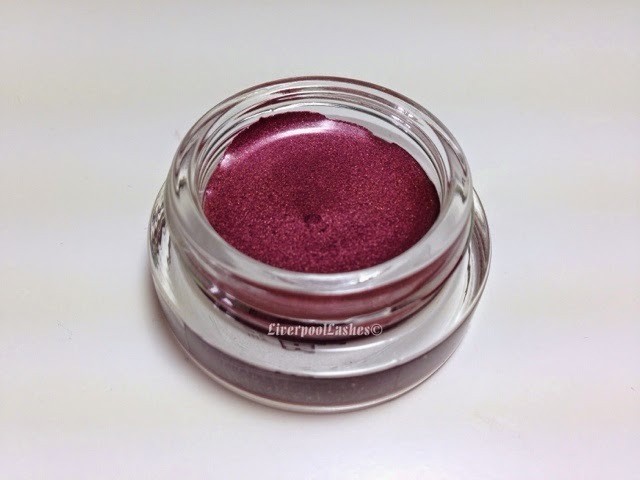 I have been wearing this shade on top of Metallic Pomegranate and I have to admit I couldn't stop looking at it. 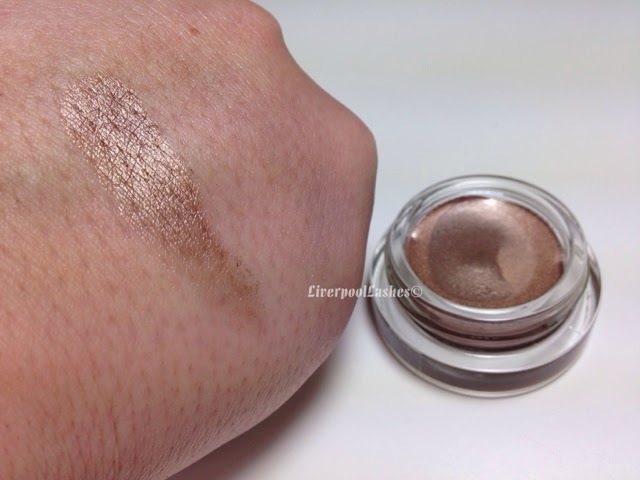 This cream shadow does have a little shimmer in it which doesn't make a difference to me. I will run this underneath my eye as well to tie the look together. I love purple tones as it's a colour but it's not too bold like a turquoise or green, etc. I hope you've enjoyed this blog post and that it's perhaps been useful in helping you choose your next purchase/purchases. I really hope that Maybelline bring out more shades but the truth is I don't really know what's missing from the collection already!